We’re working on developing a feature film based on the last years of life of the composer Enric Granados, who died in 1916. It will be a film shot in English, mainly in Barcelona and other locations such as Madrid, Paris and New York. It will have a prominent cast, an internationally renowned director which will combine quality and commercial values in order to reach the wider public. A triangular love story: an artist between his muse and lover and his wife and six children while Gaudí was building his best architecture work and the world was entering modern times. 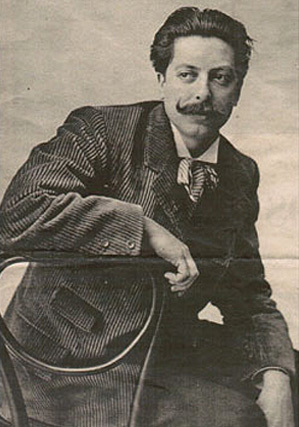 Granados is the most universal and representative composer of classical music to come out from Spain in the early 20th century. He represents a figure of a pianist-composer who followed the romantic tradition of great artists such as Franz Liszt and Frédéric Chopin. The film soundtrack will cover a significant part of the extensive music catalog writen by Granados. The leitmotiv will be the piano suite Goyescas, inspired by Goya’s Caprichos and the painter’s love affair with the Duchess of Alba. His last years, from the peak of Granados’s professional life until his tragic death in a shipwreck in the English Channel when the ship was torpedoed by a German submarine, were also intense in his love life, and in European history, with Barcelona as the best example (height of Modernism). Based in the novel The Fallen Nightingale by John Milton, the script (written by Mike Seid and Anna Soler-Pont) is currently being polished before going out to directors.